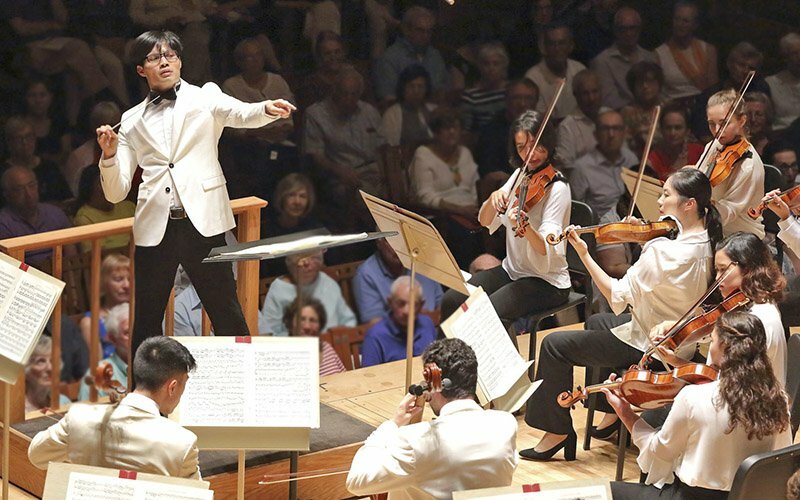 Tanglewood Music Center Fellows (the exceptional students from around the world who study at the namesake festival over the summer) get exposure to world-class maestros and emerging new stars. 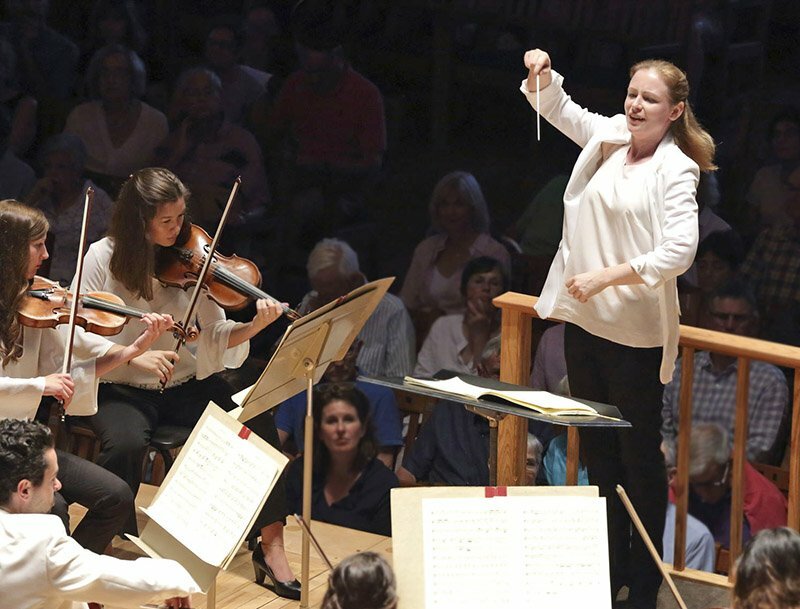 On Monday night the Tanglewood Music Center Orchestra worked under TMC Conducting Fellows Gemma New, Yu An Chang (also incoming BSO Assistant Conductor), and the inimitable Herbert Blomstedt. The event not only allowed the young orchestra to experience these conductors, but also showcased to the audience a quintessential TMC modus vivendi – exceptional individual talent formed into a cohesive and expressive orchestra in matter of days. The concert had a logical flow, even though Mozart’s Haffner Symphony preceded a Beethoven overture. Played with violins sitting antiphonally, the TMCO attained and maintained a gracious space throughout, despite conductor Gemma New’s somewhat tight beat. She did succeed in generously bringing out inner voices, especially in the denser textures of the first movement. The opening chorus rang out in round bowls of sound, although certain tonal shifts like the shocking appearance of F-sharp major in the development could have been capitalized on more. The second movement andante was rounded and graceful, wavering here and there in only the most microscopic of details. frequent soli passages with the now distant 2nd violins and violas needed more attention to be cohesive, and the treacherous unison runs in the strings sometimes phased rather than locked in, weakening the effect. New navigated the typically Mozartean “not-quite-one-but-not-quite-three” minuet tempo inventively, and the orchestra followed. The finale’s quicksilver capers occasionally faltered though, an issue not of tempo but most likely of preparation time. But, a word on the failure to achieve perfection: with this much talent on stage, nitpicking is usually the only way to find fault; unfortunately, small issues (entrances and rhythmic unity) were endemic. The horns had the worst of it, with many shaky entrances possibly due to the unrelenting humidity that lay like a stifling blanket over Ozawa Hall (one assumes it must have been more oppressive under the stage lights). The basses also late often came in late enough to be noticed — a lapse audible even when Blomstedt was conducting, evincing the problem lay not with inattentive leadership. Yu An Chang took the reins for Beethoven’s Leonore No. 3 Overture. After a long silence he started the ensemble with a precise but generous beat that moved continuously while containing all details. With jacket buttoned, he did appear in the more energetic sections as if he were about to lift off, but the power that bubbled up from within his frame was matched by the orchestra’s output in a muscular but apt reading. Chang led with a dramatic flair most effective in the transition to the offstage trumpet call and was not afraid to lay on the brass in the tutti sections. Acknowledging limited rehearsal time and the fact that the fellows, just a few weeks ago, were scores of strangers scattered around the globe. Both younger conductors seemed to grapple with the balance of the ideal orchestra in the mind’s ear and the real orchestra sitting before them, allowing certain minor missteps to reappear in the classical repeats. When Blomstedt led the Brahms Symphony No. 4, though, the rare mistakes were at once corrected and never repeated. The “Master Teacher” aspect probably accounted for that. While jovial and upbeat throughout the evening, the players’ attention and dedication visibly increased when playing under Blomstedt, now a living legend at 90. This author too must admit he is bowled over to witness his craft). His Brahms came from the same intimate sanctum as whatever he leads — a deep love of the music, devotion to the score, gentle but irrepressible authority, and supernatural dedication to the expression of music as a transcendent achievement of mankind. Add to all this the particular magic which comes from our wise elders collaborating with young talent of tomorrow, and one has the recipe for a phenomenal, meaningful performance. The opening lines of the symphony lapped like waves on some eternal shore — perfectly encapsulating Blomstedt’s gesture and intent. Unison runs, pianissimo tutti sections, and dotted rhythms now worked flawlessly. A slight rallentando at the end of the first movement (without fermatizing the last note) gave the impression of an arrival rather than a settling into place. 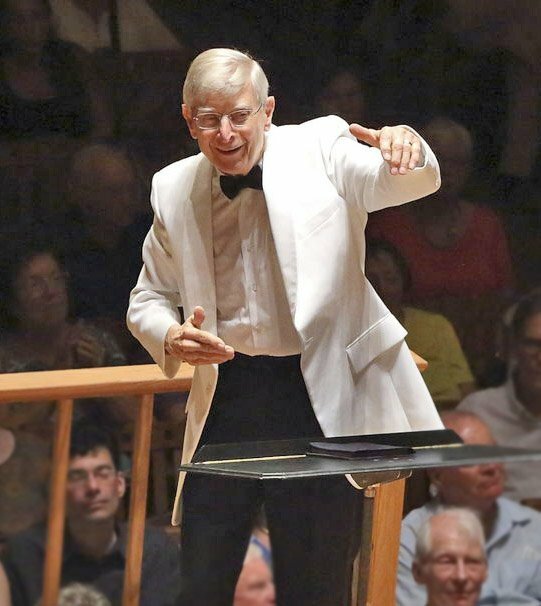 In the second movement, Blomstedt’s arm was with the string pizzicati, while his soul was with the woodwind chorale melody, which succeeded with no physical interference from the podium. The third movement was sinewy and celebratory, ending with a period rather than the indulgent exclamation point one often hears from overzealous maestros. And the finale exploded to a propulsive coda with energy that made it sound faster than it was, with a final bar cataclysmic in its (correct) brevity. It is a great education for the TMC fellows, already masters of their craft in many ways, to experience that emotional depth and adherence to the score do not stand in opposition; Blomstedt is the ideal conductor to show them this. The appreciative TMCO Fellows shot back excited smiles when he challenged them or prodded for more, and whole individual and collective hearts. As a final endearing moment, after shaking the hands of all the front row strings, at his third curtain call Blomstedt stayed within the ranks of the ensemble, camouflaged by the sea of white coats. From there he acknowledged every principal and section, and as they stood the riotous applause transferred from conductor to orchestra. Mr. Valentino. Read some more before. Kind regards from Switzerland.